I spent five days down in the sun-filled state of Florida with my sister’s family. I made dinner one night. My sweet nieces are obsessed with Harry Potter and told me in so many words that I really must – absolutely must – go to Harry Potter Land at Universal Studios. Someday I would love to do that, but it just wasn’t in the cards for this trip. Sigh. So! Not to be discouraged I decided to bring Harry Potter Land to us! The Three Broomsticks would be proud. Now, I made a version of Butterbeer a year or so ago that was hot and very butterscotchy. Not bad, but so sweet that I could only manage a sip. This one is a soda version and I like it much better. My nieces and nephews also gave it a thumbs up and confirmed that it tastes just like the stuff at Harry Potter Land. You use imitation butter extract – something that I didn’t even knew existed, but can actually be easily found right by all your other extracts in the seasonings section at your local grocer. Go figure. To make the butterbeer: Place 1/2 teaspoon of imitation butter in glasses. 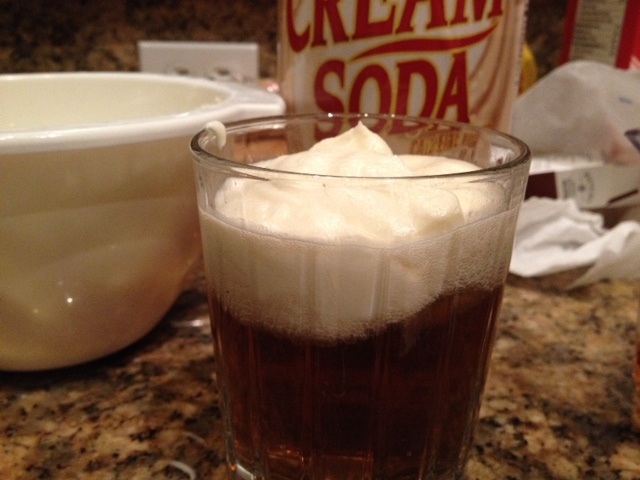 Pour 12 ounces of cream soda into each glass, over the butter. Lightly stir. To make the foam: In a large bowl, or the bowl of a standing mixer, whip the heavy cream on medium high speed for 3-4 minutes until it starts to thicken. Add the sugar and continue whipping until very soft peaks begin to form, another 3-4 minutes (if you need to whip more or less, then be sure to do so, the times can vary quite a bit based on environment). Stir in the vanilla and imitation butter, then whip for another 30 seconds or so, until soft peaks form. Spoon a generous portion of foam on top of each glass of butterbeer, mixing gently, if desired (or spoon the foam into the bottom of the glass and pour the butterbeer over the top). Serve immediately.